So as the Mayor concluded causing a rupture of applause, the DJ, who is known as DJ Drunk Girl, got on his mixer board and got the music going again for the venue. Before the night hit into the next phase though with the band Back Out Now the owner brought her whole team up to thank them and get some everlasting photos taken by some of the professional photographers who were brought in for this entertaining and memorable evening. After the night was officially kicked off by the owners loving embracement and words to her team it was time to begin the evening. Time to kick off and show the people what an event at this place was all about. The singer got on the mic, the bass guitar player got ready to deliver the sound that would keep it all together and the drummer sat down to bring the beat and the strength of the song for the evening. With the opening of any business, many people only see the final product of the work they put into opening the place. What happens before that is sometimes never known. With her husband Jarrod’s help, her team, and the other contractors, they worked tirelessly to get the doors open as quickly as possible. Because of their efforts too, they may have broken some records or created some new categories in the process. Because of that hard work they may have set a New Jersey record for the quickest business transition from one location to another. When they closed their doors at the other location officially on December 9th, they then quickly moved everything over on December 11th, and by the time the inspector walked out the door on December 18th they were officially able to open up the doors again for their anxious clients. On top of their speedy work in opening the doors, they were rewarded, not for that, but for something they had been working on for a long time. Since its official opening in 2014 IB has been working to build itself to the best it could be and in 2018 they finally achieved a well deserved award. When you step foot in IB a different aura penetrates your senses. You begin to see all of the different elements, but can’t seem to find the words to describe the place. If you’ve been to the old location, on the other side of main street, you definitely see and feel the difference. It’s a difference that they’ve been hoping and working to have for years. The new look offers a slightly different appeal and feeling. Now, with the bigger space they’ve added a few things and the high ceilings paired with the woodwork, eclectic floors, and simple yet impactful paint colors it delivers a unique comfortable feeling. 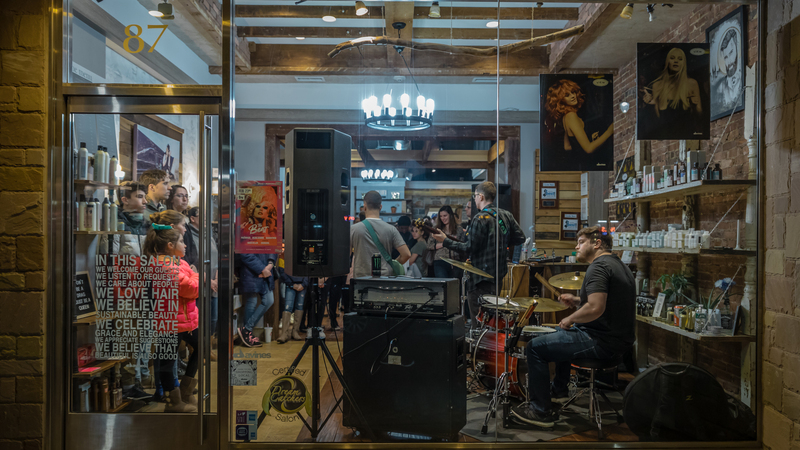 If you’ve ever been concerned about the music someone plays in a salon, or anywhere for that matter, there’s no worry here as they’re going to keep it interesting. They put that mindset into all aspects of their business too as they give you a little bit of this and a little bit of that. A lot of times too, “It doesn’t make any sense.” It’s an environment that engages with all the guests and keeps it random and fun. Which is just the way they want it too. From the look, feel and the music, it’s what they’ve envisioned for a long time and now it’s real. It’s not just in the salon they have fun either. IB has had a few events where they’ve brought a band in to perform and for everyone to just hang out and have a good time. It’s just a low key professional environment that makes everyone want to come in, hang out and check out the place. If you want a high end experience with a down to earth vibe then IB is the place for you. Although she wouldn’t change that experience for the world it was just time. With everything they wanted to do, there was just no stopping them from growing and expanding. With that though comes some big changes. As IB’s visions and plans kept growing that meant they kept on getting more. They kept building their business but over time it came to the point where they needed more space. So after Three Hearts Home, the business that was there before, closed it seemed like a perfect fit. Having the vision in her mind for a long time to expand, the owner Jenny Jacome’s business mindset kicked in quickly. She saw that this could be the spot to make those visions she had a reality. She acted quickly and in August they made it official. It started with a phone call when she was on vacation, with the owner of the building in June, and then in August they signed the papers. With big moves like this requires other people to believe in you and your vision. Without the belief of Tom Genova, the owner of the building, IB would not have been able to make the move. After seeing and believing her vision of expanding he was even willing to wait until the lease was up on her other property. Growing up in the industry and being around it since she was 11 years old, she found her career at an early age and would eventually become an educator in it. So it’s not really a surprise to have her business be the one to make this move in Central New Jersey. It’s a decision that is sure to bring the stylist game up another level around here. Ib will provide advanced education with Guests Educators and Stylists. 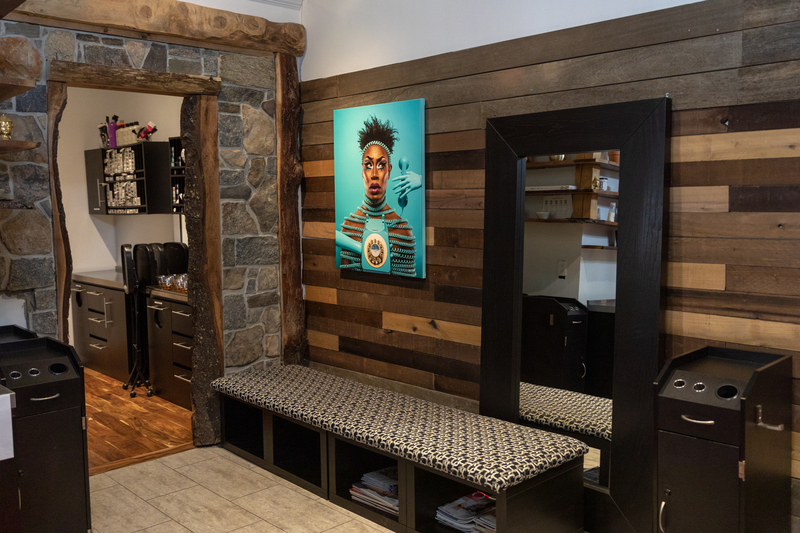 It will allow already licensed stylists, future professionals currently in Cosmetology school, assistants, salon owners, barbers and makeup artists in Central NJ to have direct access to education. Ib Education Center, is a place that will push them to follow their desire to advance and hone their techniques in their career as a stylist. Like other businesses IB started as the owners freelance project before she decided to open Illustrated Beauty. When it comes to the name and figuring out what to call it, she was inspired by her great friend while Jenny did her hair. Her tattoo artist Leah, owner of Artisanal Tattoo, was instrumental in giving her just the right amount of inspiration, guidance and support to commit to the name Illustrated Beauty. Her startup freelance mindset is still in play too as she continues to build and feel the pressure of being a business owner. Many people have memories of Somerville from where it was at 5, 10 even 20 years ago. It looked like a completely different town. The owner has seen it for over twenty years. The goods the bads and the uglies. Through it all, since she was 11 watching her Mom being behind the chair and leading her team in her beauty salon, to now being a business owner herself, she has stayed. You can hear her passion for this town with her attitude, every day walking around town and when you get the chance to talk to her. It’s people like Jenny and her team who are helping build Somerville up. It’s about working together and the Team here does everything possible to create a space that allows the community to feel comfortable in. They want to create events that will bring everyone together. Sometimes it doesn’t even have to make “sense” either. 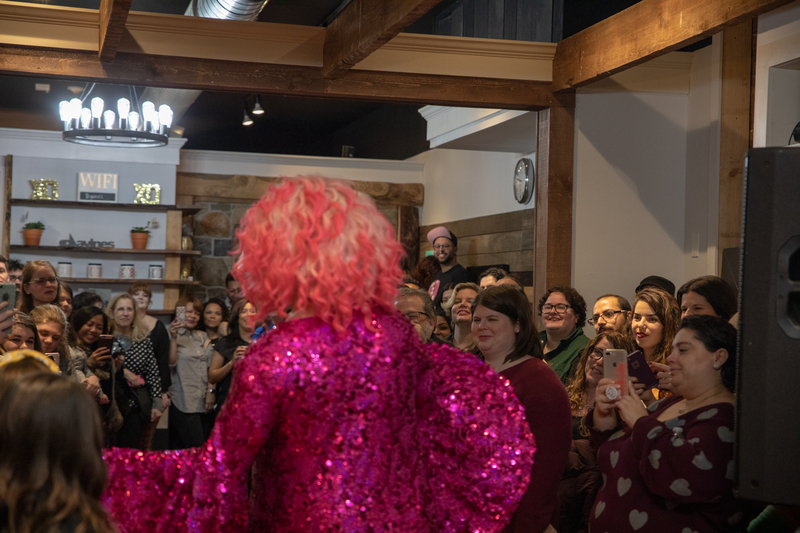 As they did with their opening event, they’re doing things that you don’t typically find in a salon in order to bring the people in their community together. After sitting in Ib for a little while you get a sense of what they’re all about. The way they work together and with their customers, reminds them and the customers of a show that last aired in 1993. The team is what helps build this culture and the owner has made it a point to hire the right people to help build this place the right way. Without the people she brought on board, in the early days, like Ashley Neuman, Amanda Hidalgo, and Amanda Rae Flemming they probably wouldn’t be where they’re at now. The owners vision for the culture, since the beginning, is that everyone is welcome. With the new store they’re not going to stray away from that mission. Part of their culture is trying new things and doing things differently. 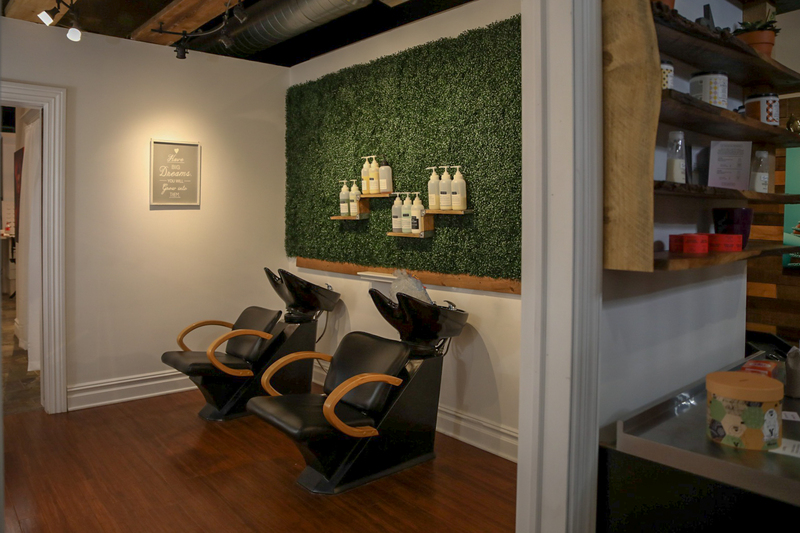 What they are hoping to do with the new locations decor and atmosphere is allow the men who come in to feel comfortable and not feel like they’re in a “too feminine salon.” With the right culture and team in place they definitely can change that persona. One way that Ib is extremely unique is that they love to support other small and local businesses. Jenny strongly believes that when you support small businesses you are supporting a dream. Because of that belief, cross marketing with local businesses is important to Jenny and she believes that it will continue to build Somerville up. For that reason she approached Cheech’s Own about cross marketing. In a community of a little over two square miles, where there are 20 different salons, competition is high. That doesn’t even include the neighboring communities, in 5-10 mile radius, that brings that number to an astronomically high number. As a person who’s just moving into town, it can be overwhelming to choose. So many times business’ are in a head on battle to draw in the new sets of hair and faces. 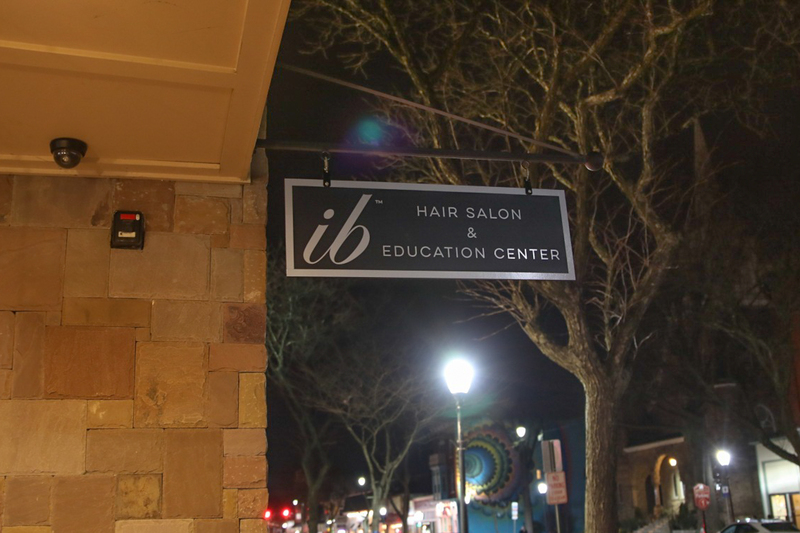 IB has a different look at the whole ‘competition thing’ with all of the salons and other business’ in the community. No, it’s not about selling another salons product when you have one of your own, but why not say “Good job” from time to time or show up to one of their events. For too long business’ in small communities have been competing with each other like it’s a bloody war zone. At IB they’re hoping to change that. If they continue to have their unique events and support other businesses, they just might spark a fire that will help this community and beyond. So as Back Out Now completed their part of the night and successfully delivered their style of music to the souls of the guests who showed up, the next stage of the night began. This stage was sure to bring this event to the next level. Before the next stage could begin though, there was a little break in the action. So, the conversations continued on and new relationships were established over more music by DJ Drunk Girl, good drinks, and fine art by David Ayllon. ...Pissi Miles and Jolina Jasmine were both ready to bring this evening to a level Somerville may have never experienced before. They were committed and ready to change that. As they started Pissi Miles began to get the crowd going as she spoke through the microphone. The exact words spoken by Pissi Miles in those early moments of her performance are unknown, but it was remembered that in an energetic wave of her hands she somehow parted the crowd to reveal the red carpet that extended the room, in which, the guests seemed to brush off as any other carpet. The performance began, and the eyes of the guests were now glued to Pissi Miles and Jolina Jasmine watching each step they made, trying to anticipate what they were going to do next. The performance they put on was something that just would be too hard to explain in writing as it was one for the ages as it filled the air with joy. ...The Grand Re-Opening of Illustrated Beauty.